It had occurred to me that I had never paid much attention to this before. Then it dawned on me: we iron our pants, steam our dresses, and do whatever we can to achieve perfectly-folded pleats across the majority of our wardrobe. As a society, we certainly take extreme care and measure to ensure that the way our garments fall does our presentation to the outside world some solid justice. I found this to be true for curtains as well. Once home, I decided to take a closer look at how this sentiment related to the way my floor to ceiling curtains were hanging in my own living room. This room, much like the pants I wear to work each day, sees a lot of visitors. Friends, family, and neighbors have all gathered in this room at one time or another to sit and chat. As such, I felt like the way my curtains fell in that room should matter greatly, but they were rather bunched and ungraceful. Do you have this problem, too? Snap Tape: this is a great option for ripple fold draperies and flat (un-pleated) curtain panels. Snap Tape is sold by the yard, sewn on to curtains, and come in black, white, and gray. See model 3091 for more detail. Pin Hooks: drapery pin hooks are great for hanging pleated curtains and achieving a traditional look. See models 4146 and 4138. 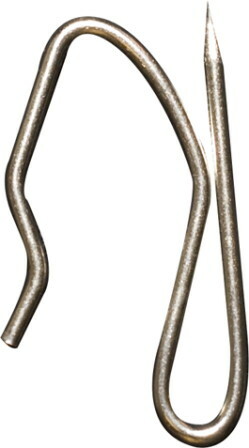 S Hooks or J Hooks: Some curtains have metal grommets across the top and require “S” or “J” hooks to hang them. These hooks are simple to use and can hold both heavy and light drapes and curtains. Model 7142 comes in stainless steel (better for damp environments like showers or outdoor use) orplated steel. Wrinkle Band or Shirring Tape and Hooks: This wrinkle band tape can be sewn across the top of a flat curtain to provide a simple way to attach spiral curtain hooks, and also can form simple pencil pleats by drawing the two cords that run through the tape. A great way to convert a flat fabric panel into an inexpensive curtain. There are also components like basic shower curtain rings and various curtain clips that can accommodate all your curtain-hanging needs. In my house, we found that the drapery pin hooks worked best for the living room curtains since they helped create that traditional pleat I had envisioned in my head since seeing in a Pottery Barn catalogue. Nonetheless, the living room looks complete and graceful for once. I think my dry cleaner would be proud.